In terms of creativity, one of the major points of difference between Michelle and myself is how we decide on our next project. Michelle will be inspired by something she has seen, she will then start devising a plan for executing the object and, once she is sure she can achieve the look she is after, she will buy the yarn. Creative and logical. I, however, tend to find myself holding a single skein/cake/ball of yarn and wondering what I can make with it. I then trawl Ravelry trying to find a pattern that works with my yardage or is striped so I can use a contrast yarn to bump up my yardage. 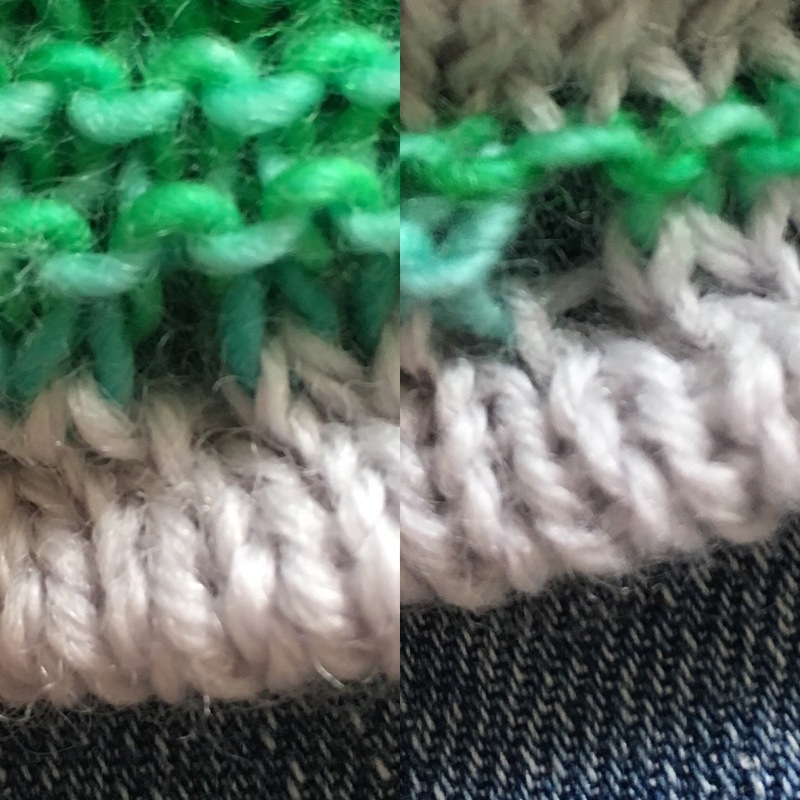 I then spend the whole of my knitting time fretting that I don't have the necessary yardage. Sometimes it all works out OK, other times I have to wing it. One of my recent finished objects started out a little like this too. 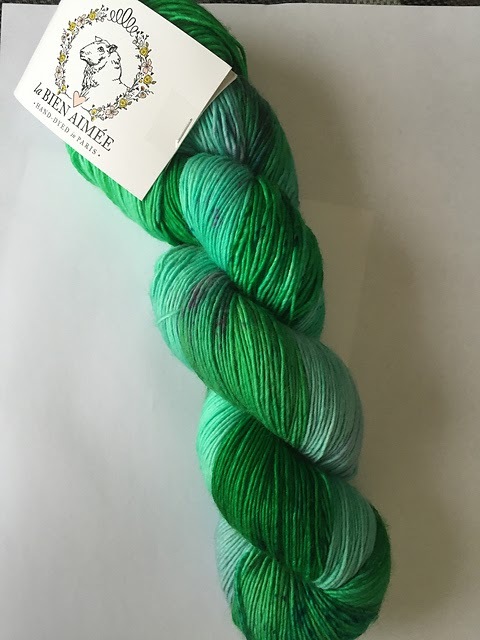 The yarn is from La Bien Aimee and the colourway is called Stephen the Mermaid. It was a gift from my Mother-in-Law from a trip to Europe. Apparently she went into a parisian yarn store and announced that she was seeking 'the greenest green'. This is clearly a winning shopping technique. And so it was, that I found myself caressing the yarn (in a very creepy manner) when I realised that yarn called Stephen the Merman could only be used for a Stephen West pattern. My Ravelry trawl began. Typically, I didn't have enough yarn to make one of his bigger designs but I had quickly fallen in love with Batad which I thought would be perfect with the Ghost colourway from Bendigo Woollen Mills that was also sat stewing away in stash. The one on the left is my fudged version and the one on the right is as per the pattern. I'm pretty happy with how it turned out and it meant I got to use every last scrap of the green. I bound off with a three needle bind off. This was also another stash down project. Its kind of remarkable that in 6 weeks time I will have been a year since I took the original photo. As you know I love love this yarn, and I love your Batad, I think the ghost worked perfectly and the finished object is so lovely and useful. 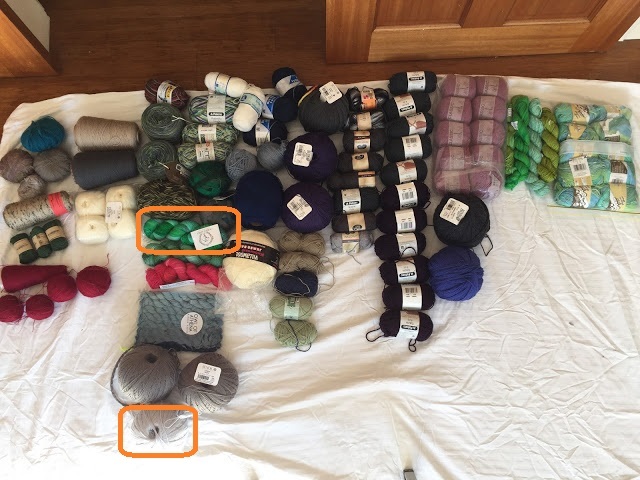 Maybe we need a photo of the stash where you mark off all the used yarn? Wait patiently my pretty it hasn't been a whole year yet! Thansk you. I love my Batad too and worn it heaps.